If you were the only sentient being in this universe, you probably would never become aware of the discrepancy between your worldview and reality-as-it-is. Of course there would be perceptual mistakes, as when the cool oasis in the distance turns out to be only a mirage. But these would amount to minor illusions. Over time you would carry forward your lessons and make the necessary adjustments. The term “reality” is used pretty loosely, even today when the discrepancy between our personal worlds and what they are meant to represent is finally acknowledged – at least by some. This acknowledgement is one of the marks of our postmodern mind. Human beings are meaning-makers, and the closed webs of meaning that we create – individually and together as cultures – are the worlds we inhabit. Even one of my conversation partners for this round uses “reality” in reference to our individual and cultural constructions – as in you have your reality and I have mine. Personally I prefer the term “world” when speaking of these constructs of human language, perspective, and meaning. Especially on the level where such constructs serve as more global habitats of meaning. This saves “reality” as the way things really are, apart from and beyond our constructs. You have your world, I have mine; but there’s still something outside our boxes, so to speak. Besides being fantasies conjured out of the creative nothingness of our imaginations, at least part of our world is meant as a representation of the way things really are. Even if we’re wildly off base – which is probably the case at least some of the time – there remains the present mystery of reality. Just because we (mis)take our constructions or representations for the way things really are doesn’t mean we should be content to persist in that delusion. If I am fully convinced that the end of history will be crashing in at any moment, this is not my reality. Even as I take it with all seriousness, sell my possessions and abandon civilization for refuge in the desert, reality is what it is. There have been countless examples where delusional prophets were forced to apologize to their followers and review their calculations the following day. So we live inside worlds of our own making. These worlds may be fairly reliable representations of the way things really are, but they also serve as shelters against the unknown. A happy and productive life would likely be impossible if we had to figure out everything from scratch upon waking each morning. Meaning provides a sense of security. But this relationship between meaning and security isn’t exactly reciprocal, in that more security doesn’t always support a more meaningful life. In fact, as we lock ourselves up inside our personal and cultural worlds, grateful for what is familiar, stable and certain, the air in there quickly goes stale. Because meaning seems to be a function of relevance, reference and transcendence, it is diminished to the degree that our awareness shrinks to the dimensions of our mental boxes. Smaller boxes feel more secure, but they are less meaningful. The authors I will be reading and reflecting on are definitely “outside the box,” as we say. Anthony De Mello (Awareness: The Perils and Opportunities of Reality, 1990) was a Jesuit priest whose life and writings were a lively dialogue with Oriental spirituality. Based on retreat talks he gave on mindfulness, freedom and happiness, this book takes a humorous yet revolutionary tour through what it means to be truly aware. 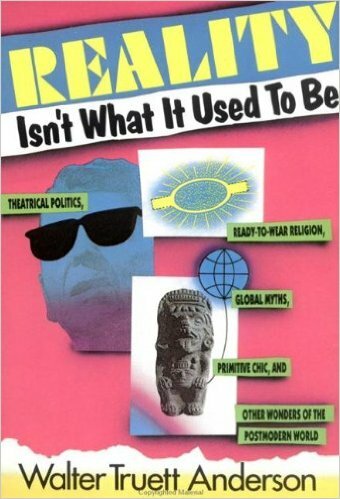 Walter Truett Anderson (Reality Isn’t What It Used To Be, 1990) wrote one of the definitive popular guides to postmodernism. In that book, he helps us become more self-consciously aware of our role as creators of the worlds we inhabit. The relationship of our brain to language, and of the constructs of language to the perennial question of truth are considered. John A.T. Robinson (Truth is Two-Eyed, 1979) was the Dean of Trinity College in Cambridge, England. He challenged current thought on matters of theology, especially the way Christian orthodoxy has made god into an article of doctrine and forgotten God as spiritual Presence. 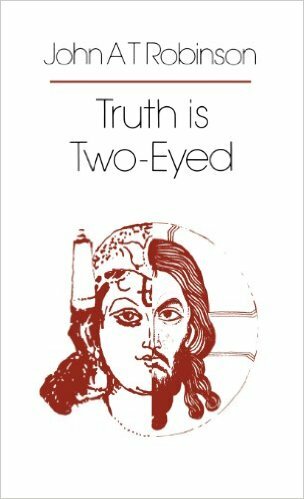 The “two eyes” in Robinson’s title represent Oriental and Western approaches to truth. I can already imagine a conversation among these three, where De Mello investigates the inner-psychological groundwork of awareness, Anderson interrogates the constructions of reality that spring up from there, and Robinson explores how very different world-constructions can challenge and enrich each other in healthy dialogue. Throughout my reading and reflections on passages from these authors, I want to carry forward from my previous Conversations the insight that reality is a present mystery. However we frame it up, whatever filters we use to make it useful to our needs, the nature of reality is such that it is both within us as the ground of our being and beyond us as the universe to which we belong. You are invited to join the conversation as well. Read along with me and share your insights by leaving comments along the way. I’ve already mentioned how Schleiermacher criticized two of the foundational doctrines of Christian orthodoxy – the providence of god and the immortality of the soul. Later on, Nietzsche would pick up this criticism with new vigor. Together they stand in a philosophical time-stream that has come to be called by several names – perspectivism, constructivism, nonrealism – and generally postmodernism. Whereas the modern West had rested on the confidence of a fixed objective world (out there), postmodernism has realized how much of what we assume as out there is really our own projection. The modern mind had also looked “up” to a god who actually existed in a supernatural space (heaven) above and outside the world, while the postmodern mind rejects metaphysical realism. And if modern religion had regarded the individual soul as indestructible and immortal, postmodernism (if it has a place for soul at all) defines it merely as our “inner life” where individual existence emerges from and dissolves into the present mystery of reality. So Schleiermacher was an early postmodernist, living at a time when the modern paradigm was losing energy and falling apart. 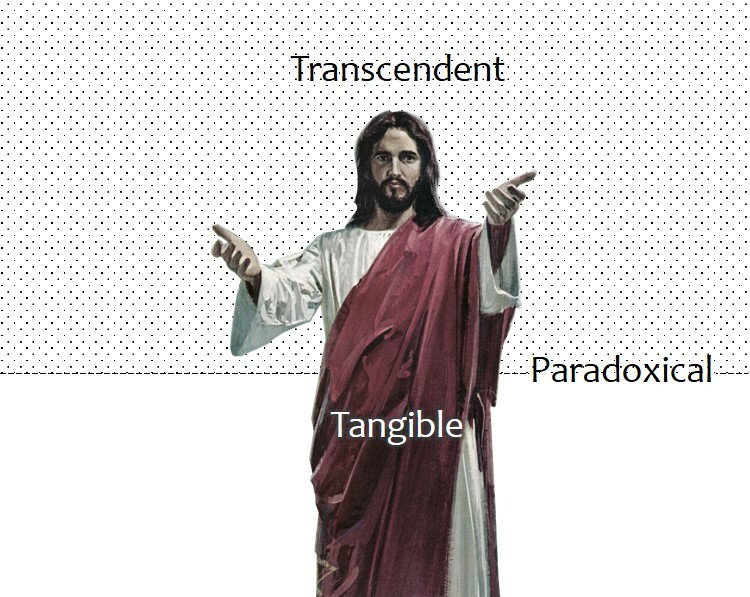 His challenge wasn’t merely to reinterpret traditional religion for a new (nontraditional) audience, but rather to reconnect Christianity to its spiritual grounding. For him, this grounding is subjective and experiential – in the human experience of reality – and not objective or external to us. In his magnum opus The Christian Faith, he defined faith as “the feeling of absolute dependence” on the living presence of God. In Christian orthodoxy the doctrine of providence refers to god’s control over world events and his predetermined purpose for the future. I shifted to a lower-case “g” to indicate that we’re talking about the god of Christian mythology, the main protagonist of the Bible who created the universe, chose a favorite nation, handed down a law code, intervened on historical events, raised Jesus from the grave, and now governs all things from a high point outside human affairs. For Schleiermacher – and others like me – providence has to do with present existence and not future destination. In each moment, I am grounded in a reality that is creative, supportive and interdependent. To the degree that I can release my ego need for security and personal control, my life begins to relax into being. This heart-beat, this breath, this life, this passing moment are simply “provided” to me. I don’t need to grip down and worry them into effect. Indeed, my nervous effort to control them actually interferes and puts them in jeopardy. Just as we can distinguish between the mythological god and the living presence of God, the soul can be defined as the part of me that lives forever (immortality in the temporal sense) or as that deep place in my life where I am grounded in the divine presence. This is where the distinction between “everlasting” and “eternal” becomes especially important. Immortality is about now, not later. It is about going deeper into reality (and becoming more real), not farther ahead in time; it’s authentic life, not life without end. Of course, this process of redefining religious terms – or rather recovering their original meaning as metaphors of religious experience – is still enmeshed in words and thoughts about the mystery. The modern commitment to building systems and constructing meaning can get caught in the web of its own making. A postmodern spirituality simply regards all of this as secondary reflection on the primary process of experience itself. We need to get back to experience, which might involve back-tracking through this construction site to the original inspiration that got it all going in the first place. This is Schleiermacher’s agenda as a late-modern clergyman and Christian theologian. But we might also just skip the project of rehabilitating doctrines and go directly to experience itself. Once there – a place we always are and only leave in our minds – we can begin to feel our absolute dependence on the greater reality beneath us (ground) and all around us (universe). It’s not about being right, but being real. Aware of my relative position in the grandeur of it all, and cultivating my own internal access point to the present mystery of reality, I no longer feel the need to cling regretfully to the past or wait anxiously for the future. This is where I Am.